This is guide is based in @mlnevese's earlier "Installing Mods in OSX a quick tutorial", updated for BG2EE, Mac App Store BGEE/BG2EE installations, and changes to recent versions of WeiDU. First, you need to locate the game folder of your BGEE/BG2EE/IWDEE game, which is where you will install mods. Open up a Finder window, and locate your BGEE/BG2EE/IWDEE application package (see below). Right click on the app and select "Show Package Contents". Go to "Contents/Resources". This is your Resources folder. If you downloaded BGEE/BG2EE from the Mac App Store, then the app package will be owned by the root user and your user account won't have permission to write files to the Resources folder. To fix this, you'll have to change the permissions. Select the Resources folder and then choose File > Get Info. Under the Sharing & Permissions pane, click the lock icon and enter an administrator’s name and password. Change the privilege for "Everyone" to "Read & Write". Then, choose "Apply to enclosed items" from the Action pop-up menu (looks like a gear). The Library folder is normally hidden. To navigate to it, hold down the "option" key while clicking on the Go menu in the Finder. The menu that appears will have an entry "Library" - select and it will open a Finder window in your Library folder. * Right click on the app and select "Show Package Contents". Right click on the app and select "Show Package Contents". If you have SoD installed, you will need to use ModMerge before installing mods. Get a copy of Mac WeiDU here: http://www.weidu.org/~thebigg/. FYI - If you're new to modding, WeiDU is an installer program for BGEE/BG2EE mods. You need it. Unzip the archive. It will create a folder called 'Weidu-Mac'. Open this folder and copy the 'weidu' program file to the game folder. Step 3: Get some mods! For BGEE, @mlnevese maintains a list of BGEE and SoDcompatible mods. For BG2EE, check out @LiamEsler's BG2EE Compatible Mod List. Download the mod(s) you want to install. Unpack the archive and copy the mod files to the game folder. Note that OSX tries to be helpful when extracting an archive and if the top-level folder of the archive contains anything other than a single folder, it creates a folder with the same name as the archive to extract the files into. You will want to open this folder and then copy the contents to the game folder. Example: You download SuperCoolMod-v1.3.zip. When you extract the archive, the files go into folder SuperCoolMod-v1.3. Open this folder and copy the contents to the game folder. Step 4: Install the mods! @subtledoctor has created a nice tool for this, called the Easy Mod Installer for OS X. Once you've installed your mod, re-launch BGEE/BG2EE/IWDEE and have fun playing your modded game! THANK YOU! This is exactly what a noob with the App Store version needs! Now, to xan! You're welcome! Let me know if there's parts that aren't clear enough or need improvement. First of all-- SO STOKED to have found your guide and to have gotten this far. I fully versed myself on modding BG2 on a PC, but on a mac....Ohhhhmylanta. Whole 'nother story. I'm really hoping that you can help me! Initially it came up saying "permission denied", however i went in to the individual folder (had already changed permissions on resources folder) and changed permissions to "read and write", After doing so i got the response "Usage: ./setup-Assassinations name-of-tp2 otheroptions". And now I'm at a total loss as for what to do?! It's the same for every mod btw, just started with Assassinations cos its the first of the mods that I want from the mod install list for mac. 1. It might not be the most recent version of WeiDU. WeiDU is normally self-updating, but that can be complicated by issue #2. 2. For the latest versions of WeiDU, there are separate binaries for Mavericks vs. Snow Leopard/Lion/Mountain Lion. If your WeiDU program is not the right binary for your version of OS X, it will crash with an illegal instruction error. 3. The mod might be packaged with the WeiDU program not having its "execute" permission set (which is the case for BG2 Tweaks). You can fix this from the command line, but you still might have issues with #1 & #2. If you really don't want to delete the files, you could also just rename them in the Finder to something like "setup-bg2_tweaks.old". Then, go ahead with the "ln -s" commands. I got it to work!!!! Well.....for that mod at least lol....Every other one I have tried has come up with "permission denied". So I go in to every file with the name of the mod I want to install and change it to "read and write", however still getting error. is there a way to changeall mod permissions at once? Is there something I am missing? Sorry to post again it's just that this is driving me nuts!!! I can't figure out what is different from what I did on the Assassinations setup that isn't working on any other mods....my train of thought has been to go to every file within the folder of the mod I am installing, changing all of the permissions to read and write, and I even unlocked the lock thingy on all of them after it didnt work...I'm so confused!! Then, copy the results and send them to me. drwxrwxrwx 95 aliKater admin 3230 27 Mar 11:14 .
drwxr-xr-x 7 aliKater admin 238 29 Jan 18:32 ..
@Alikater‌ - Ok. So, all of the files like "Setup-Angelo" and "Setup-Sellswords" are copies of WeiDU. Most of them are copies of the most recent WeiDU for OS X Mavericks. But, the "weidu" program file you copied into your Resources is the Snow Leopard version. So, I assume you're running OS X 10.6, 10.7, or 10.8. The first thing to do is to get rid of all those copies of WeiDU for Mavericks. This worked perfectly!!! thank you so much!!! Is this the same problem as alikater? I'm pretty sure I deleted all of the setup files. Unzip the download and copy the "sox" program into Xan/audio, replacing the version already there. @AstroBryGuy‌ Thank you so much for writing this. Have you had experience trying to install SCS? I'm unsure of how to do it. You're welcome. And yes, I've installed SCS on OSX. It installs like pretty much any other mod, but it does take longer than most with all the processing it does. Unarchive the OSX-strategems-v28.rar file (If you don't have a program to handle .RAR files, I recommend Unarchiver https://itunes.apple.com/us/app/the-unarchiver/id425424353?mt=12). 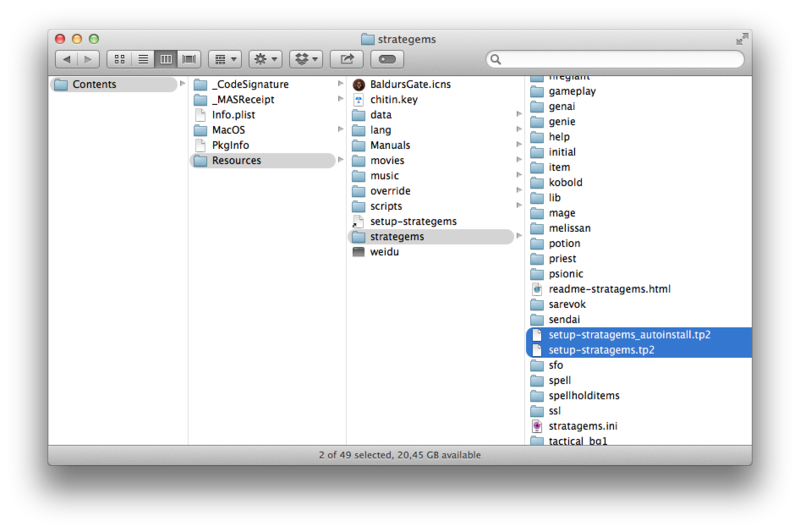 Go into the folder it creates and copy the "strategems" folder to your Resources directory. I'm guessing this is because inside the "stratagems" folder I have all these files: setup-stratagems_autoinstall.tp2; setup-stratagems.tp2? However deleting them does nothing. I've added a screenshot of the Finder inside the Resources folder. @mrdeluxe‌ - Another person had a similar error message from the command line. The issue was that they had copied the program "weinstall" rather than "weidu". Can enter the following command from the Terminal (in your Resources folder) and report back the result? I want to see the file size of the program called "weidu" in your Resources folder. @mrdeluxe‌ - As I suspected, you copied the program "weinstall+mavericks" from the WeiDU package rather than "weidu+mavericks". Delete the "weidu" file currently in your Resources directory and the setup-strategems symlink. Replace it with the "weidu+mavericks" file from the WeiDU package (renamed "weidu"). IT WORKED! Thank you do much! In any case, fantastic! Thank you so much for the help! This worked like a charm. I only added FreeAction since I'm almost at the very end of TOB, but I guess that my earlier frustrating attempts were foiled by trying to use the latest Weidu when using 10.6.8. I always (with Unfinished Business and tweak pack - didn't try other) get to the point whe're i can chose the language - but then i get 2 Errors.... any idea what i have to do ? drwxrwxrwx 26 Patrick admin 884 26 Mai 17:48 .
drwxr-xr-x 7 Patrick admin 238 26 Mai 17:17 ..
@TheDoor drop the setup-ub.tp2 in the ub folder and try again. Also, be sure the dialog.tlk is inside Resources/lang/en_US. ok there was no folder /lang/en_US. now I have deinstalled the whole game and I'm doing a new installation. To many files in were in my resources folder, so i don't knew if they all belong there or not. I will give you an update after the installation. With the new installation there is the lang/en_US folder with the dialog.tlk and all mods are installed successfully. @AstroBryGuy‌ when i try to run './setup-bg1npc' it says no such file or directory. In the resources folder there is the file setup-bg1npc so i don't know what is going wrong! @AstroBryGuy‌ I fixed my last issue but now i get the error "Too many levels of symbolic links", any help? Can you enter the following command from the Terminal (in your Resources folder) and report back the result?